Maybe there’s a pipeline coming, maybe two. And maybe a 30,000 horse power compressor station. Maybe the noise won’t be too bad and maybe we can live with the smell. Maybe no chemicals will escape into the air. And maybe methane, benzene, toluene, formaldehyde, carbon monoxide and nitric oxide are not too bad for your health anyway. Maybe the risk of explosion is very low and maybe the evacuation plan will work fine. Maybe our property values will not go down. Maybe the roads will hold up and if there is any damage done, maybe the Franklin taxpayers don’t end up paying for it. Maybe the pipeline will survive the rainstorms. Maybe the hillside construction will not cause erosion and mudslides and maybe the Ouleout Creek will refill itself and maybe the waste water that will be dumped into it is OK. Maybe the trout will return. Maybe our water pressure holds up. Maybe the wells for Franklin’s emergency water supply will survive. And maybe Williams/Cabot are reliable pipeline builders. Maybe it is OK that they use thicker pipes in urban areas than in rural areas. Maybe we can do without 300,000 trees. Maybe our aquifers will stay clean. Maybe the nighttime security lights are not so bright. Maybe the monitoring of air quality is not necessary. Maybe the 100 ft radio towers don’t show too much. Maybe the emissions will not be above EPA standards. Maybe our children won’t get asthma. Maybe we can still drink the water from our springs. Maybe we can still drink the water from our wells. Maybe our school doesn’t have to close down. 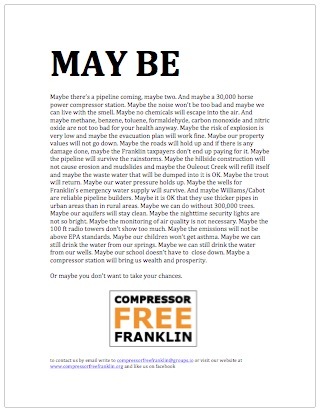 Maybe a compressor station will bring us wealth and prosperity. Or maybe you don’t want to take your chances.